For the artist Emory Douglas, using pigs to parody police and government officials was an important symbolic device. Though the cartoon style was light-hearted and comical, it was also designed as bitter provocation, baiting the sometimes brutal forces of law enforcement and imperialism. "And that's what I did. We put the cops on their feet and showed them running--bullets coming at them and them running. 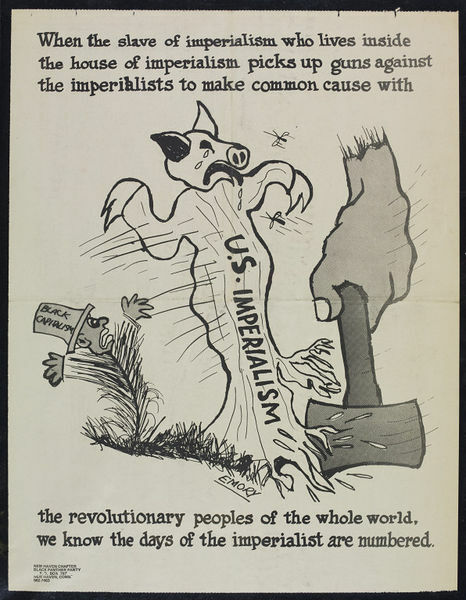 I think that captivated the attention...."
A crying pig, symbolising Imperialism, is being cut down by a black hand wielding an axe. 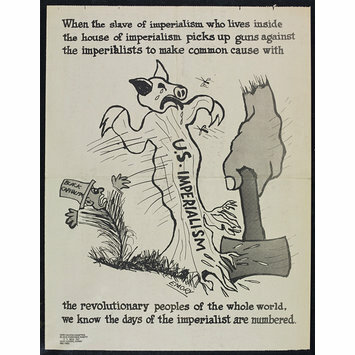 "When the slave of imperialism who lives inside the house of imperialism picks up guns against the imperialists to make common cause with the revolutionary peoples of the whole world, we know the days of the imperialist are numbered."